Above are a few of the over 1000 signs we designed and manufactured since September. These include carved 3-D, 2.5-D and engraved Mahogany, Redwood and Cedar, and painted High-Density-Urethane. The signs shown above were made for businesses, apartments & condos, restaurants, B&B's, residences, ranches, churches, and national parks, Some of the recent plaques we made are shown in Fig 2 below. We design & fabricate CUSTOM Carved, Engraved & Sandblasted Wood, HDU and Metal-Coated 3-D & 2.5-D signs & plaques for commercial, Government and residential customers. We offer discounted factory-direct retail prices, and wholesale prices to resellers. These are made for exterior & interior locations, and last 10 to 30 yrs with little maintenance, with a 2 yr warranty. We make sizes from 6 inches to 20 feet wide, and you can order from 1 sign to 1000 signs. We have over 12,000 designs on this website, the largest on-line selection in the US; or we will create a new original design for you at no cost; or we can duplicate another sign or make an existing design. We use only the very best premium materials, and fabricate them using the finest craftsmanship. We make all our products in the USA from American materials, and deliver anywhere in the USA, Canada, and many overseas locations. We have outstanding design and management customer service; Christie and Regina are very knowledgeable and experienced, and will help you to choose the best solution for your signage needs. One of them will be assigned as your Project Manager, and will work directly with you during the design, manufacturing and shipping process. They will provide status and resolve any issues with your order. We have good turn-around times; from the time we receive a firm order on a custom sign or plaque, until we ship, it is 4 to 5 weeks. Duplicates or standard designs take 3 to 4 weeks. We also take rush orders. We are a "Green" company, and we use renewable, environmentally-friendly resources and donate funds to plant trees for every wood sign we sell. Please click on the short video above to see a brief summary of our sign and plaque products and the methods we use to design and make them. This video has sound so please turn on your speakers, but it also has text. WE HAVE A WIDE RANGE OF UNIQUE CUSTOM DESIGNS AND SUPERB CRAFTMANSHIP. We create beautiful, attractive and unique Three dimensional (3-D) carved and 2.5-D sandblasted signs, with letters & art elevated (raised and bas-relief) or engraved (e.g., incised, bas-relief recessed, V-carved) into the sign. Our styles range from highly-stylized modern to classic to vintage and rustic. Our signs range from very simple, inexpensive sandblasted or routed text signs to more expensive signs with complex art, construction, and high-end materials. We make our signs and plaque substrates from (1) wood (Redwood, Cedar, Mahogany, Maple, Walnut, Red Oak, and vintage barnwood); (2) synthetic wood composites and plastics (i.e., 20 lb/ft3 and 30 lb/ft3 premium Precision Board High-Density-Urethane (HDU), High-Density Color Core Polyethelene (HDPE), acrylic, PVC, and Hard-Coated Expanded Polystyrene Foam (EPS)); and (3) metals (aluminum, and steel), metal veneers of bronze, brass, copper, German silver, aluminum, and stainless steel; and gold, silver, and copper leaf gilding, and solid cast bronze and aluminum signs and plaques. We use advanced computerized design, computer-controlled carving, routing and cutting, 3-D bas-relief carving, computer-controlled laser engraving and water jet cutting (for metal); hand-carving; multi-level sandblasting; polishing and burnishing; and cut-out and stand-off letters & art appliques to achieve 3-D effects. We make dimensional and carved plaques and signs which are then hand-painted with colorful long-lasting UV-resistant enamels, and/or stained and clear-coated (wood only), and/or gold- or silver leaf gilded, and/or metal coated (bronze, brass, copper, silver-nickel, stainless steel, antique iron). We can also add a digitally-printed vinyl giclee applique for photos or detailed art onto a carved sign. 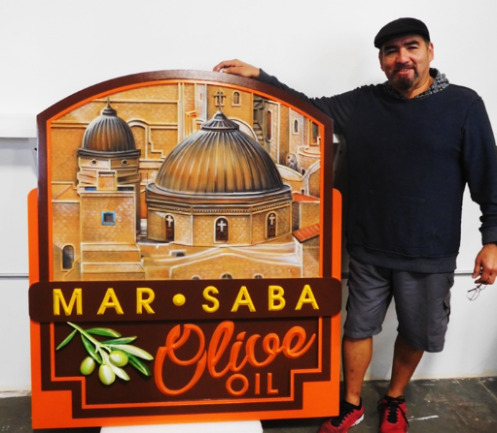 We have a unique capability for combining various artistic techniques, manufacturing technologies, and materials into a single sign that will last for many years in any climate. We make custom indoor and outdoor dimensional signs and plaques for both residences, businesses, government organizations and non-profit groups (such as churches) in sizes from 6 inches to 20 feet wide. We have a wide variety of designs; we can make almost any design, any shape, any font style, any color scheme, any logo/ emblem/ art, and we design and build custom carved 3-D bas-relief designs that most sign shops cannot or will not make. Our craftsmen and artisans are the very best, averaging 5 years experience in making our custom signs, and we guarantee customer satisfaction on every sign or plaque. We have a 2 year warranty on every sign or plaque. We also offer wrought iron hangers and scroll brackets, wood and metal posts, and monument sign Extended Polystyrene (EPS) foam bases & pillars. We design & integrate signs, and can arrange to have your sign installed by a local installation contractor anywhere in the US, if you wish. This figure shows examples of signs and plaques in our seven Product Lines. Click on the picture above to go to a web page with a more detailed description of the design features of each type of sign or plaque. Fig 2 - Above are a few of the over 800 plaques we designed and manufactured since September. These include carved 3-D and 2.5-D Mahogany wood and bronze, brass, gold, silver-plated and artist-painted High-Density-Urethane. The wall plaques shown above were made for Federal and State government organizations, military units, police & sheriff departments, churches, and families.To see over 2500 other wall plaque designs, please visit our Wood & Metal Plaque website (click on photo to go to that website). Our Products. On this website you can view over 12,000 photos of carved wood and HDU signs and plaques, for every style and application, all methodically organized so you can find designs you like. Please visit some of our 45 photo Galleries by clicking on a numbered gray box in the left margin, or enter your sign type in the Google search bar on the right side of the header above, to find the type of sign you are looking for. There is also a detailed listing of the contents of each Gallery on our Galleries Overview page. We make many signs and plaques for every application. We also have another major beautiful and extensive website featuring our wall & podium plaques, for our Wood & Metal Plaque Company (click to visit). If you are looking for a wall or podium plaque, you will find on this website a very broad selection of 2500 designs displayed in forty (40) photo galleries, a thorough description of various 3-D and 2.5-D artist-painted, metal and wood plaque styles, and a specific price list to allow easy comparison shopping. However, there are no signs shown on the Wood & Metal Plaque Company website, only wall and podium plaques and seals, so if you are looking for signs, you are currently on the right website. Our premium custom hand-crafted dimensional signs & plaques are fabricated from the finest materials and are made using superb craftsmanship by skilled and highly talented artists and artisans, most with 5 to 10 years of experience building our signs.We design and manufacture over 5000 beautiful custom signs & plaques each year. When we say Custom, we mean 100% CUSTOM. We will design your sign(s) or plaques(s) exactly to your preferences and requirements. We will build your sign / plaque with any shape, any size, any material, any text, any font, any artwork, any colors, and any finish that you specify, with as many design iterations as it takes (we send you multiple proofs, up to 10), so that your sign or plaque is exactly what YOU want. Our designers have lots of ideas, high creativity, and loads of patience, and will work with you to give you the sign or plaque you have dreamed of. You can start with any of the 12,000 sign & plaque designs on this website, or an entirely new design. We can also duplicate existing signs or designs; send us a picture or a photo and we will duplicate it with any modifications you want. Above is an example of one of our carved 3-D, artist-painted outdoor signs made of long-lasting, waterproof premium High-Density-Urethane (HDU). We paint our signs with an artist-brush and airbrush using the finest sign paints made (Matthews and 1-Shot), and clear-coat all our signs twice for maximum protection against rain, snow, humidity, UV radiation, and graffiti. We offer a 2 year warranty, and our outdoor signs will last over a decade with no appreciable fading or degradation. 2. HARDWOOD PLAQUES & SIGNS. Furniture-grade 3-D, 2.5-D and engraved hardwood (Mahogany, Black Walnut, Cherry, Maple, Oak, etc,) plaques & signs with premium stains and clear-coats. (see Gallery 3 for examples) You can also view hundreds more hardwood plaques on our companion website, the Wood & Metal Plaque Company. (click on link to visit). 3. HDU SIGNS & PLAQUES. Carved 3-D, 2.5-D, sandblasted, or engraved and hand-painted Premium-Grade HDU (High-Density-Urethane) signs & plaques (see Gallery 1 for 2.5-D and engraved and Gallery 2 for 3-D examples).You can also view over a thousand more 3-D and 2.5-D artist painted wall plaques on our companion website, the Wood & Metal Plaque Company. (click on link to visit). 4. METAL PLAQUES & SIGNS. Beautiful long-lasting metal (bronze, brass, copper, nickel-silver, stainless steel and aluminum) coatings and veneers on 3-D and 2.5-D carved HDU Signs & Plaques, also cast metal plaques (see Gallery 7 for examples). You can also view hundreds more metal plaques on our companion website, the Wood & Metal Plaque Company. (click on link to visit). ...........5. 5. GOLD-LEAFED SIGNS & PLAQUES. 24K gold, silver, and copper-leaf hand-crafted gilded wood & HDU signs & plaques (see Gallery 7 for examples). You can also view over 50 more gold and silver-leaf gilded plaques on the gold-leaf plaque page our companion website, the Wood & Metal Plaque Company(click on link). We sell both Factory-direct Retail and Wholesale. Our clients and end-users include businesses, professionals, apartments & condos, Federal, state and local governments & their agencies, all military branches and units, non-profits, farms & ranches, and individual consumers for their primary & vacation homes. All our products are made in the USA, and we ship throughout the USA, Canada and Overseas. We have a great variety of unique and beautiful designs (8000 of them on this website), or we will work with you to design a custom sign to your specifications. No design is too complex or too difficult in our areas of expertise. Our expert craftsmen and artisans provide the finest workmanship from modern stylistic to classic to vintage wood signs, and we are proud of every sign or plaque we make. We have very reasonable prices, starting as low as $99 for small signs. Our turnaround time from firm order to shipping is typically 4 to 5 weeks; we can do rush jobs (additional fee) in 3 weeks or less. We have a 2 year warranty on all our outdoor signs in any climate, but most will last a lifetime. You can make an inquiry, ask for advice, request an estimate or place an order for your custom sign or wall plaque through this website. Please email us at info@artsignworks.com or call us at 951-698-8484. We have very friendly and knowledgeable customer service representatives (Christie and Regina) who will be happy to help you. We welcome casual and information only inquiries, and we have a "No hassle, no-pressure" sales policy. We are "The Friendly Sign-makers". Call us or email us today to get more information or to get your sign design started! You can view over 5000 carved commercial signs on this site in Galleries 10-12,and 24-29.. These include Corporate, Attorney, Physician, Dentist, Financial, Retail Store, Restaurant, Golf Course, Winery, Resorts, Hotels, and Apartment signs & plaques. Click on photo to see more commercial monument signs in Gallery 28. Can't find anyone to make your custom carved or sandblasted dimensional wood, High-Density-Urethane (HDU), High-Density-Polystyrene (HDPE), hard-coated Expanded Polystyrene (EPS) foam, or metal sign or plaque the way you want it made? Do you need some design ideas for your custom outdoor wood signs, or your interior wall plaques? We will work closely with you to design and build the custom sign or plaque you want at an affordable price. We offer a combination of creativity, quality and value,and have a very wide variety of sign designs and sizes. We take great pride in every beautiful and unique sign or plaque we make. We offer a 2 yr warranty for every sign or plaque in any climate, and use special proprietary coatings to make our signs robust, long lasting, and low maintenance. SIGN PRICES. We give great value for your money. We offer factory direct-to-you prices. We use the latest computer technology combined with old-world hand-craftmanship to reduce our costs, passing cost savings on to you. We price primarily by the area of the sign or plaque, but also by material, complexity and detail. HDU signs are generally less expensive than Cedar or Redwood signs. HDPE signs are about half the price of HDU signs. Our wood and HDU signs and plaques cost from 70% to 90% compared to those of similar signs from most other sign shops and suppliers, including on-line companies. Our wholesale prices for other sign shops and re-sellers are about 20% to 30% lower than our retail prices. We accept major credit cards, personal checks, and for Government organizations and some businesses, Purchase Orders (P.O's.) You can get a detailed design proof (with multiple iterations) made for $30 for an original design, which is credited to the purchase of your sign, if you order it, thus the design is free. We generally require 50% down before we go into production and the remainder the day we ship, except for P.O.'s. We ship our products by UPS and freight throughout the USA and Canada. We also ship selected orders to other countries overseas , including US military bases, and we ship to APO addresses. 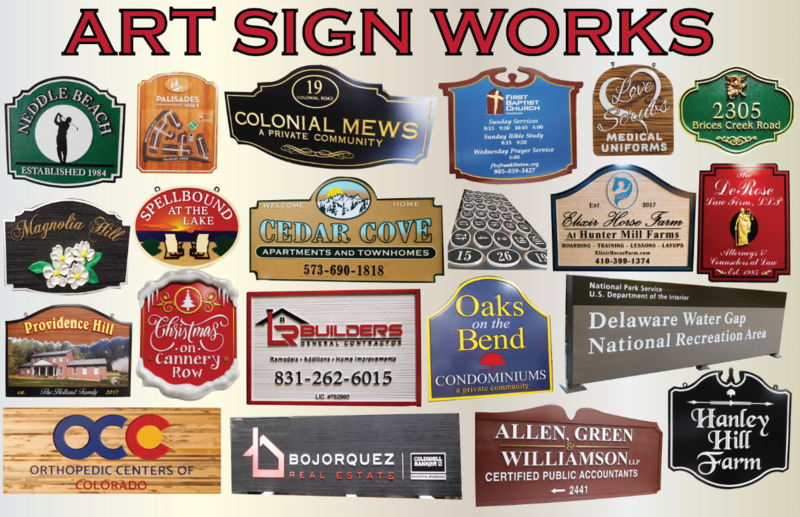 Please call us at 951-698-8484 or EMAIL us at info@artsignworks.com for free advice, estimated or exact price quotes, design options, and delivery schedules, or any additional information, without any obligation. Our customer service is outstanding; and every customer is important to us. Our Customer Service Representatives, Christie and Regina, are experts on our products from small plaques to fancy custom vintage wood signs. You will find they are very helpful, and will respond to your request for information promptly. HOW TO NAVIGATE THIS SITE. Navigation links are shown in the gray boxes in the left margin (click on box to go to page). Photo Galleries (1 through 35) can be visited by clicking on one of numbered light gray boxes in the left margin. There is a detailed listing of the contents of each Gallery on our Galleries overview page. Business web pages (e,g, prices & design options, request a quote, place an order ) can be viewed by clicking on a gray box in the upper left margin. Other general company and technical information can be obtained by clicking on the dark gray tabs on the top header. There is also a Google search bar for information on this website in the header, upper right box. You can view over 2000 signs and plaques for homes, estates, beach houses, mountain cabins, lake cottages, and farms and ranches on this site in Galleries 18, 20, 21, and 23. Click on photo to see more signs in Gallery 18. SIGN TYPES AND STYLES. Whether you’re looking for a simple residence sign or plaque, or much larger and complex custom outdoor wooden signs for your business or office, Art SignWorks can handle projects of any size. Creativity, excellent craftsmanship, professionalism, attention to detail, outstanding customer service, and affordable prices are what you can expect when you work with us. If you can’t find exactly what you’re looking for in our extensive product photo galleries of over 8000 signs on this website methodically organized and indexed for your search convenience , please call us at 951-698-8484 M-Fr 9:00 AM until 5:00 PM Pacific Time , or email us at info@artsignworks.com, and we’ll do everything in our power to design and build you a custom sign that you will be proud of. We will provide you design options, price quotes and a delivery schedule within a day or less. SIGN PHOTO GALLERY OVERVIEW AND SEARCH. For specific sign applications (e.g. lawyer sign, farm sign, city entrance sign), please visit some of our 50 Photo Galleries, which are listed by a numbered title in light gray boxes in the left margin; you can click on the Title to go to that Gallery. There are 100 to 500 sign designs in each of the 50 Galleries. You can see 150 of the most recent signs we have made on our Signs-of-the-Month page. . 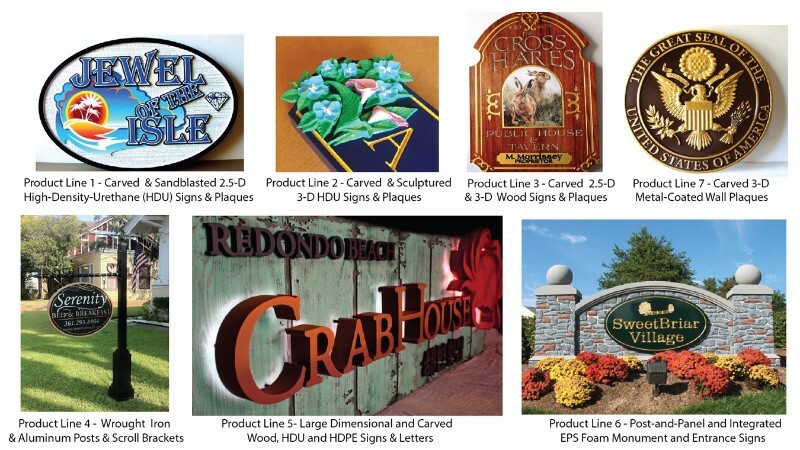 This page gives an overview of the wide variety of styles and materials we offer for our dimensional signs & plaques. You can also download our 57 page catalog in PDF format, by clicking on the link "Art Sign Works" Catalog below this paragraph. The catalog shows about 10% of the most popular signs in our 45 Galleries, about 650 signs. This Catalog can be saved, printed, or viewed in a slide show mode by clicking on "View - Full Screen Mode" on the Adobe Reader tool bar.There are no prices listed in the Catalog, because price depends on size and every sign or plaque can be ordered in many different custom sizes and design variations. For our Retail prices,along with their design features, please see the Price, Size, and Design Features page. We sell at factory-direct retail prices to individuals, residences, farms and ranches, professional offices, businesses, government, military, and other organizations, and we sell at wholesale prices to sign shops and other re-sellers with a resale license. You can view over 600 carved wood & HDU apartment and condominium signs of all types and styles in Galleries 19 and 19A on this site. We make entrance, building name, unit number, wayfinding, rule, recreational, parking, traffic and map signs.Click on photo to see more apartment entrance signs in Gallery 19. Alternatively, to find a specific type of sign, such as "Oak leaf address sign", or "sign with Skiier on it" , or "red wooden stop sign", or "lawyer directory sign" or "B&B sign", or "sea horse beach sign", please enter these key words in the box on the top right of this page with "Google" in it and the search engine will give you examples of signs on this site, which you can click on to go to the referenced page. Please refer to the sign letter and number when inquiring about a sign design/size/price. If you spend a few minutes visiting the relevant Galleries, you may find custom outdoor wooden sign and indoor wall plaque designs you will like, or we will work closely with you to create a new custom design. We can also duplicate existing signs; please send us a photo or drawing. We design and make our signs & plaques for residences,farms & ranches, professional offices, companies, stores, businesses, churches, federal/state/county/city governments, and the military services. We specialize in designing and building custom vintage and outdoor wooden & HDU signs. For our most popular individual residential and property name signs, please visit Gallery 18- residential address and property name signs, Gallery 20- seashore/beach signs, Gallery 21 - lake/mountain signs, or Gallery 23 - ranch & farm signs. A few examples of these are shown in Fig. 3 above right. A few examples of apartment and condominium signs are shown in Fig 4 on the right. If you are a Federal, State, City/Village/County government or military customer, please click on Government Signs & Plaques for an index of our carved wood and metal-coated 3-D wall plaques and signs designed for the Army, Navy, Air Force, Marine Corps, and Coast Guard; Federal, state & city/county governments; and police, sheriffs and firefighters, shown in Galleries 30 through 33. Figure 5 on the right shows examples of these beautiful wall plaques, which we make in diameters from 10 inches to 5 feet. We also make wall plaques for colleges, schools, fraternities & sororities, companies, and clubs. WE CAN DESIGN AND MAKE ALMOST ANY SIGN DESIGN. We can modify any design shown in the Galleries, replicate an existing sign from a photo, develop a completely new custom design for you, work collaborately with you to develop your own design, or build-to-print an already completed design done by another firm. We offer a very wide range of styles including formal, ornate, elegant, bold, commercial, stylized, whimsical, and rustic/western. Much of our business is one or few of a kind signs or plaques for residences and businesses, but we also do large production jobs, up to thousands of similar signs or plaques for apartments, residential communities, hotels, golf courses and retail chains, and we sell our products wholesale to over 200 sign retailers, including sign shops, designers, contractors, and brokers (see Wholesale to Sign Retailers). OUR SIGNS HAVE LONG LIFE AND MINIMAL MAINTENANCE. We use the very best materials and manufacturing processes to create signs which have a very long life (20+ years for HDU Signs) and require very little maintenance. We provide a warranty of 2 years, and we expect our HDU and indoor wood signs to last for several decades. We carve our HDU signs and plaques out of premium ultra High-Density-Urethane (HDU) Precision Board Plus sheets made by Coastal Enterprises, in Orange, CA. We use 20 lb/ft3 HDU for all our signs & plaques, which is 30% denser and stronger than the 15 lb/ft3 HDU used by other sign manufacturing companies. Our signs carve cleaner, last longer, and are less susceptible to impact damage than HDU signs made by other companies. We use prime, kiln-dried, knot-free, vertical grain all-heart Redwood, Cedar, and Mahogany that are supplied by Forest Plywood and Wood Products. We use exclusively Ultra Low VOC Matthews automotive-type 2-part polyurethane acrylic paint and clear-coats , which are UV and graffitti resistance, so there is very little fading when the sign is exposed to direct sunlight, and graffiti can usually be cleaned off with acetone. Matthews paints cost $200/gallon, compared to house paints which cost $30/gallon that most other sign companies use. Matthews MAP will last 20 years or more before repainting.We use 1-Shot Low VOC Oil-Based High Gloss Lettering Enamels for text and artwork. 1Shot is simply the best (and most expensive) lettering enamel in the world. It costs $250/gallon. OUR SIGNS & PLAQUES ARE ENVIRONMENTALLY FRIENDLY. We are a "green" company. Of course, our domestic and imported wood signs are "Green". We only use wood from renewable forests that use environmentally sound practices. For every wood sign we sell, we donate money to Arbor Day Foundation to plant two to five trees, depending on the size of the sign, .to support important tree planting efforts around the globe. .
Our Precision Board Plus HDU is made out of special eco-friendly components, including state-of-the-art ‘green urethane’ formulations.The new Plus formulation has achieved a certified “Carbon Balance” of 3 to 1 and a “Rapidly Renewable resource Content” of 23.9%. We use environmentally friendly stains, primers, topcoats and clear-coats. The Minwax stains we use are Low VOC. Matthews Ultra Low VOC polyurethane acrylic paints and clear-coats limit VOC to less than 50 g/L while providing greater durability, gloss retention and hiding than standard acrylic polyurethane paints provide.We also use a Low VOC version of 1-Shot sign enamel for painting text, borders and artwork. All our manufacturing and painting processes are Green, with minimal air pollution, because our dust collectors, paint spray booths, and fully-enclosed and recyclable sandblast booths cause very low air pollution and carbon emissions.